Circuit: MICRO POWER OVER-TEMPERATURE ALARM __ Circuit designed by David A. Johnson, P.E. The circuit is powered for years by a single 3 volt lithium battery. It sounds an alarm when the temperature exceeds a certain point. 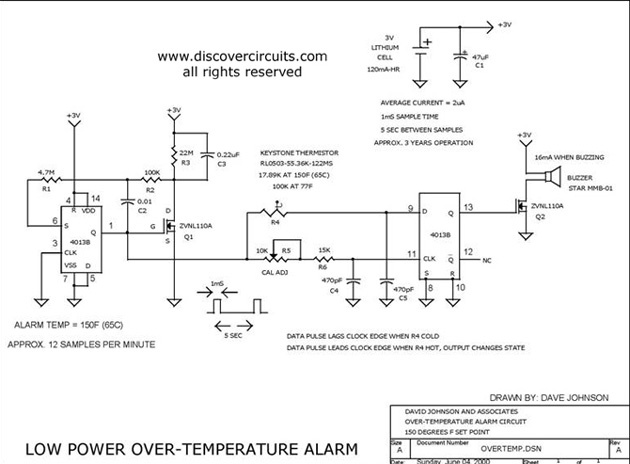 With some minor changes the circuit could also be configured for an under temperature (freeze) alarm. The circuit uses a cheap but accurate thermistor as the temperature sensor.